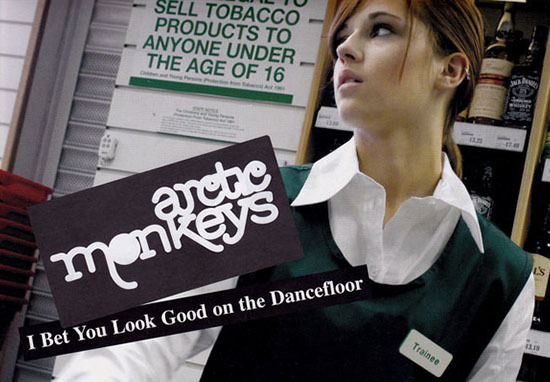 It’s been 13 years since Arctic Monkeys released their eponymous debut single I Bet You Look Good On The Dancefloor, a song which became an instant indie classic which, suitably, hasn’t left dancefloors since. Back in October 2005, when we were all bopping along to Gold Digger and Don’t Cha on our fifth generation iPods, the single hit number one in the charts, reminding us all, Britain can produce some pretty darn decent guitar bands. Not since Pulp had such an exciting band come out of Sheffield and made as big an impact on popular music as the Arctic Monkeys did. Their blend of working class attitude with serious musical chops meant, not only did fans and critics warm to them, but they had serious potential for bigger things to come. While the front cover of their debut album, Whatever People Say I Am, That’s What I’m Not, has become iconic since its release, their debut single also featured an anonymous but nonetheless recognisably distinct cover. Featuring a young woman working at an off-license staring into the distance, the single’s imagery hinted at the song’s meaning, and summed up what a lot of young people often feel – that there’s more to life than just your job. Thirteen years on, the folks at RadioX tracked down the cover star of I Bet You Look Good On The Dancefloor, and found out what she’s up to now, and how she came about her claim to indie fame. The teenager, named Jessie May Cuffe, was approached by a Liverpool-based design company called Juno while on a night out. I had snuck out with my mates to Liverpool aged 16, we were in a bar called Bumper when the design company took a snap of me and asked for my contact details. I got a call to come in and meet the team and then I was asked to do the shoot with another girl – luckily the band picked my picture. Despite the band not officially releasing any music, Jessie already knew Alex Turner and co., and was already a fan. I’d heard of the band before the shoot and I’ve remained a huge fan ever since. I first met the band at the Ritz in Manchester, at the time they were just typical 19, 20 year old lads winding me up and moaning at me for playing the single over and over again through their speakers because they were sick of hearing it. Now aged 29, Jessie isn’t recognised as often as she used to be for the single’s cover, and believes her ‘boss claim to fame’ has always been ‘positive’. It’s been 13 years and I still tell anyone who’ll listen. My mum still has a shrine of it on her wall as soon as you step in her front door. The band’s debut album went on to win the 2006 Mercury Album Prize. As for the distinctive guy smoking a cigarette on the cover, check out what he’s up to here.